Their name means "destroyer" for a reason. Sometimes, archers in fantasy settings come across these peculiar weapons: Energy Bows, literally bows and crossbows without the pesky need for arrows. Though these weapons may impart some magical advantage such as Bottomless Magazines (in the context of being able to shoot continuously with no reloading), they will still need to be operated in the same fashion as a mundane bow would, including nocking. This is despite the fact that they may lack critical parts of a mundane bow (like the string) and their projectiles may not be subject to forces like gravity or wind, making it more awkward for a trained archer to operate. One is a solid bow that does not fire mundane arrows, but some sort of energy-based beam or projectile instead. These kind of energy bows are more common, and may or may not double as melee weapons. Two, the bow itself is made of energy: Hard Light is common, but there are also cases of bows made of fire and other usually-formless materials. They may or may not shoot arrows made from the same material as the bow. Sometimes Energy Bows pop up in Super Sentai shows as the weapon of The Chick or Lady of War, and may be related to Ki Attacks. In other settings, it's a natural weapon of choice for the Magical Native American. May overlap with Abnormal Ammo, Spontaneous Weapon Creation, Sacred Bow and Arrows, and with Invisible Bowstring. Subtrope of Energy Weapon — see also Pure Energy, Flaming Sword, Laser Blade, and Sword Beam. Bleach: Quincies (see page image) are a clan of human magic users who can manifest bows and arrows made from spiritual energy. 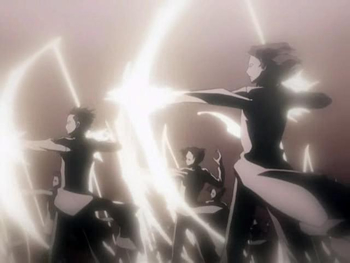 Some use Hard Light bows (Uryuu's initial preference) and others use bows of such concentrated energy that they appear completely solid (his father Ryuuken's preference). Quincies traditionally prefer bows to distinguish themselves from the sword-wielding Shinigami, but they do have the ability to create a wide range of Energy Weapons that defy the expectations of reality: for example, Quincies that prefer swords can still fire arrows from the blades, and Ryuuken is capable of using his bow one-handed. Ikaros' Apollon, from Heaven's Lost Property. Chaos later manages to get one as well. Gan Deeva, from Earth Maiden Arjuna. Sailor Moon: Sailor Mars's Flame Sniper shoots some sort of red/orange energy. The bow itself appears during the casting of the spell and is made of fire. One briefly appears in Mobile Fighter G Gundam, used by the Rising Gundam along with, curiously, a solid-bladed naginata. Siestas from Umineko: When They Cry had bows, that fired golden threads, that pierce and destroy everything with unimaginable precision. Signum's most powerful attack in the Lyrical Nanoha series is Sturmfalke, an energy projectile launched from her Device Laevatein when it assumes its rare bow form. This attack is a Shout-Out to SRW's Phantom Phoenix, just as Signum herself is an Expy of Lamia Loveless. RahXephon: The titular mecha has this technique. The bow itself is made of white energy while the arrow is blood red and capable of firing into orbit. The first time it's used this way, it's a visual Shout-Out to Neon Genesis Evangelion. Raideen, which is probably the Trope Codifier. In Slayers TRY, one of the Dark Star weapons was a bow, compared to the other four which are magical Laser Blades of some kind. The bow is also the most powerful of the five. In Mahou Shoujo Madoka Magica, this is Madoka's weapon if she becomes a Magical Girl - and in every previous timeline where she did. In the "final" timeline, Homura trades in her guns for a bow of her own. Belldandy's angel, Holy Bell, in Ah! My Goddess, makes hers from Wind energy. Suzaku from YuYu Hakusho, and his Prism Storm of Torment/Dark Lightning Shockwave technique, which shoots seven arrows composed of lightning. A single arrow causes the entire body to course with electricity, making it fatal to normal humans. Yue from Cardcaptor Sakura has one of these. Unfortunately, it only appears once. Both Perseus and Liliana use one in Campione!. In Naruto, this is the main weapon of Sasuke's Susano, firing huge purple arrows of semi-solid chakra. Once he upgrades to the Eternal Mangekyo, he gains the ability to shoot arrows made of Amaterasu fire. In Unlimited Fafnir, Mitsuki uses one in battle against the dragons. Minor superheroine Maya in The DCU wields a Type 2. In the second main volume of Young Avengers, Kate / Hawkeye picks up a "Kree composite soul bow" from Marvel Boy. He considers it outdated, she thinks it's "vintage." Rosario Vampire: Brightest Darkness has this in the Artimus Arrow spell, which Astreal Ezrana learns in Act VI. It's also a cause of Awesome, but Impractical: the arrow is powerful enough to one-shot a Nigh Invulnerable rylo demon, but draws so much power from the magical ether that, according to Yukari and Ruby, if they even tried to hold it, the power behind it would cause their bodies to literally explode. Chewbacca's preferred gun in Star Wars is a laser crossbow. EU and other sources call the weapon "Wookie bowcasters". According to the manual, the energy blasts have a solid metal core to increase kinetic energy, and enable ricochet, scattershot, and poison ammo, while still having the energy damage of a blaster. Essentially a railgun with a plasma sheath. In The Force Awakens Chewie's bowcaster is shown to have a lot of force behind it, when Han uses it and is surprised to see the thug he shot go flying back. In Rogue One, Chirrut Imwe uses a laser-longbow that can be cunningly disguised as a bostaff. He can take down fighter craft with it. Did we mention Chirrut is blind? In Immortals, the Epirus Bow is this. It creates infinite magical arrows anytime the string is pulled back, and can decimate both men and rocky walls. Both the hero and the villain for some reason only use the bow a few times each, despite its obvious potential for destruction. The book Echoes of the Great Song by David Gemmell has Zhi-Bows. In The Light Fantastic, an energy bow is used to fire a magical arrow to track Rincewind's exact whereabouts on the Disc. The arrow, a concentrated spell, will also kill him, but to the wizard Spelter, locating him alive is not necessary. Deirdre from The Mystic Knights of Tir Na Nóg had a crossbow that fired bolts of air (but the special effects made it resemble an energy weapon of some sort). The Pink Ranger's Power Bow sometimes fired arrows charged with pink energy in Mighty Morphin' Power Rangers. In Power Rangers Zeo Princess Archerina of the Machine Empire (by marriage) fired energy arrows out of her Sword. In Power Rangers in Space, Psycho Pink shot energy arrows. They'd become physical arrows (with the same punch) during Power Rangers Lost Galaxy. The Riders who use a Genesis Driver in Kamen Rider Gaim use the Sonic Arrow as their primary weapon: a bow that uses a spring-loaded lever in place of an actual arrow, and fires energy arrows. It also has blades on the limbs of the bow, allowing it to be used as a melee weapon. Brilliant Energy weapon improvement from Dungeons & Dragons 3.5, which can be applied for arrows and other munitions. ''The Horde Campaign Set has the Iron Bow of Gesen, which can fire a lightning bolt three times per day. Dragon #127 has the Phantom Bow, which can fire "shimmering arrows" that vanish if they miss. On article on the WotC Dungeons & Dragons site presented weapons from the Dungeons & Dragons cartoon including Hank's energy bow "Heatseeker". The "Force" enhancement from Magic Item Compendium causes any ranged weapon requiring ammo to deal force damage rather than the normal physical damage done by the weapon. The fan-made "Phantom " enchantment is essentially the magic equivalint of this, alowing a bow to fire pink energy arrows (even without a string) and letting crossbows and firearms to work without ammunition, shooting blue energy instead and only requiring you to recycle the firing mechenisam. Finally, the Soulknife class has a Prestige Class that changes its psionic knife to a psionic bow, in accordance with the second version of this trope. Like everything else about the Soulknife, it sounds a lot cooler than it actually is, given its stats on paper. The Solar Exalted have Charms that allow them to shape arrows, and eventually bows, out of Essence. Magic: The Gathering: Ravnica's Silhana Starfletcher is one of the first varieties. The Maiden Guard in the 8th edition of Warhammer have glowing bows that fire more powerful arrows than normal bows. BIONICLE: Kongu Inika's Laser Crossbow. Super Robot Wars has, among others, Phantom Phoenix (Angelg's strongest attack) and one of Bellzelute's attacks. Some other robots (original or not) has them as well. Pit's bow in the Super Smash Bros. series. This extends to Dark Pit as well. Not to mention all of the bow-type weapons he can use in Kid Icarus: Uprising; though this is a more borderline example given that these bows don't need to be nocked. Nightwolf from Mortal Kombat can use his magic to conjure up an ephemeral bow that fires spiritual arrows. Some of the attacks of Emilio in the game Psychic Force have him fire arrows of light. Several of the summons in Golden Sun attack enemies with these. The Short Bow of Gesen in Baldur's Gate II shoots small lightning bolts and doesn't need any ammo. The Crystal bow in RuneScape, made out of elven crystal, has well over two thousand inherent charges, each of which creates one glowing green energy arrow. It's not a truly popular weapon, though, as it degrades over time, and turns into a small piece of crystal once its charges are depleted. The recharge itself is fairly expensive as well, starting at one million ingame coins at first, though it comes down to a fifth of the original as the bow attunes itself to you. Another, and more reliable in stats, is the Zaryte Bow, which is energy arrow type. At a cost of around 20 million coins and expensive repairs here and there, this bow rivals that of some of the stronger crossbows, and packs quite a punch. Yet another, even stronger Energy bow, is the Seren Godbow, which is currently the strongest weapon in the game. To obtain it, you have to either cough up billions of coins, or fight Telos, an SNK Boss with some of the toughest mechanics in the game, until you get the unpowered bow and three untradeable orbs required to power it up. Rising Sun Archer Maidens in Uprising, the expansion to Command & Conquer: Red Alert 3, seem to use energy bows of some sort. They're physical bows, but they glow at the ends and the arrows they shoot glow too and are effective against tanks. The attack, Shining Shot, from Dragon Quest VIII and Dragon Quest IX is a powerful bow technique that fires a burst of light arrows at enemies. The Ethereal Crossbow from Heretic fires crossbow bolts of green magical energy in a burst, being the equivalent of Doom's shotgun in that game. Lenneth's bow attacks in Valkyrie Profile are composed of some kind of energy, setting her apart from the other archers in the game. Likewise when she appears in Radiata Stories. Most of the Archer attacks in Valkyrie Profile Silmeria manifest in this way. Incidentally, archers in this game were considered very powerful. The Amazon's Magic Arrow skill in Diablo II fires a bolt of mana that replaces the need for arrow quivers and does extra damage. A few unique bows have the special property "Fires level X Magic Arrow", meaning they shoot Magic Arrows as the basic attack and can be used with Strafe or Multishot. The Legendary Bow Thori'dal: The Stars Fury from the Sunwell in World of Warcraft generates magical arrows when the bowstring is drawn. It was more impressive back when you needed ammo to fire a ranged weapon, but the bow still has a unique firing animation. Chronologically appearing before Thori'dal, the artifact "Thas'dorah, Legacy of the Windrunners" still uses physical ammunition (and even has its own quiver), but is capable via certain traits of firing coalesced wind arrows. Might and Magic VI and VII, at least, have artifact bows that do this. The bow itself is perfectly real and substantial, but the missiles are ice or lightning spontaneously generated when the (unloaded) bow is fired. Additionally, a bow with the "Of Carnage" enchantment inflicts no extra damage, but the missile explodes on impact with a small but useful blast radius (which confusingly does not count as magic damage for those creatures immune to normal weapons). In Kingdom Hearts: Birth by Sleep, Aqua's Keyblade Glider is also a giant bow that fires energy arrows. As cool as her bow is, it's only able to be used in two areas of the game. Birth by Sleep also features Braig wielding "arrowguns" that are crossbow shaped and fires energy bolts. In Kingdom Hearts III, the stylechange for the Shooting Star Keyblade gives Sora his own crossbow shaped arrowguns that fire magical energy arrows. In The Elder Scrolls V: Skyrim, there's the adept level spell "Bound Bow", which summons a nifty looking purple flame Daedric bow, and 100 Daedric arrows for 120 seconds. After his first trip to the afterlife, Tommy in Prey (2006) can summon a spirit bow. During the resurrection sequences after death, you even use the bow to shoot flying creatures to determine how much health and mana you spawn with. The Talon Engineer in Mass Effect 3 Multiplayer uses this as his main weapon, known as the Omni-Bow. It can fire five arrows at once, either in a fanning formation, or in a straight line that homes in on enemies. Not only that, but he can also fire Concussion Arrows, which blows enemies off their feet, or Armor-Piercing Arrows, which do massive damage against protected enemies. In God of War II, Kratos gets Typhon's Bane, a bow that shoots gusts of wind instead of arrows. In III this is replaced with the very similar Bow of Apollo, that shoots arrows of fire instead. Bow of Apollo looks pretty much like any other bow, whereas all the parts of Typhon's Bane except the grip are made of a sort of gas-like substance. Magic bows in Dragon's Dogma are an example of the solid type. They're nifty weapons that at first look like an elaborate set of stringless limbs. When 'nocked' however, they form a bolt of magical energy that can lock onto, and home in on targets. Serah's Bowsword in Final Fantasy XIII-2 is a variation of the concept. The arrows fired by the bow are actual physical, and oddly crystalline, arrows, but they don't actually exist until after Serah has loosed one. Ezreal in League of Legends fires blasts of light from a bow which emerges from a gauntlet on his left hand. Usually the bow is small and only seen for a fraction of a second, but when he channels to summon his ultimate attack, the thing is enormous. In Dark Souls II the Bow of Want crafted from Nashandra's soul has a special attack that fires lightning without using any arrows. Dark Souls III has the Miracle Lightning Arrow, introduced in the Ringed City DLC. Using it creates a bow out of light that fires lightning bolts. Clerics from Perfect World have Plume Shot as their starting attack skill, which looks like a bow and arrow made out of purplish-white energy, and deals physical damage while using the magic attack stat. Takumi, one of the main character's siblings and an archer from Fire Emblem Fates, wields the Fujin Yumi, which has a bowstring made of wind magic (hence the name), and fires arrows made of the same. The Pulse Bow in Terraria changes any arrows it uses into energy bolts that can ricochet and pierce through enemies. Hunters who unlock their third, void-based class in Destiny get to fire bolts of void energy from a bow formed of void light. In Bayonetta 2 there's the Kafka weapon, a large bow crafted from the body of a demonic dragonfly that has a endless supply of venomous spears or even infernal insects that it can fire. In Awesomenauts, Cowboy Cop Rocco wields an ACOG Blackout G-Mag Laserbow. It doesn't really fire like a bow (despite being longbow-shaped, it's semi-automatic and held in one hand), but the bullets fly like arrows. Devil May Cry 3 gives Dante a a demon laser crossbow/gun called the Artemis. It's really useful when equipped with Gunslinger style. One can target multiple enemies at once, can be fired into the air, resulting in a rain of bolts on enemies, a huge charge with extra damage. Also, there are enemies called Enigma, demon statues with multiple limbs that can cast energy bows to attack. Grey and Khita in Atlas Reactor, both characters on The Straight and Arrow Path in a futuristic sci-fi setting, have bow-like weapons that shoot bolts of energy. Grey has an entirely solid pistol crossbow that shoots bolt-shaped blasts of energy, while Khita has a longbow that can shoot both bolts of energy and what seems to be solid arrows (albeit ones that ignore gravity). The archer class in fantasy MMORPG TERA has a bow with a magical string that generates all kinds of arrows for the player to fire, without the need for a quiver. Wayward Sons: Ipalyo's custom weapon. Stored in Hammer Space, and uses his Force Field powers to form arrows. In Mystery Babylon, one of the ancient artifacts of power in Kick Girl's collection is Cupid's Bow, which fires arrows of energy that cause large explosions. Though initially wary of letting her companions touch anything so dangerous, she eventually gives it to Delilah. SCP-154 is a pair of bracelets that creates one of these. the arrows however are the bones of the arm. Dreamscape: Keedran, in her true form, can fire an arrow of light. Dungeons & Dragons: Hank the Ranger's weapon "Heatseeker" was an energy bow. Opal in Steven Universe is a fusion gem that fuses the weapons of the two gems she's made of, Amethyst and Pearl, into an enormous bow which shoots magic arrows. The Native Martians from Futurama use bows with energy arrows. Rodimus Prime uses a bow in his Transformers Animated incarnation. The string and the two arrows it fires at once are made of orange energy. Mostly, this homages/parodies Hawkeye, whom Rodimus has always resembled; this version's resemblance to him is greatly increased and he carries the same signature weapon. Allura's Voltcom weapon in Voltron Force. The Blue Center Voltron formed by her lion gets the Titanic Trident, with freezing powers instead. Evangelyne from Wakfu, as well as other Cra people, have bows that can shoot energy arrows which cause a variety of magical effects. Star Wars: The Clone Wars: It's the Nightsisters' Weapon of Choice, explained as having plasma based arrows and a plasma bowstring with a grip at the center, since the string is deadly on its own. Sky from Winx Club wields one on Eraklyon when he's brainwashed by Diaspro.